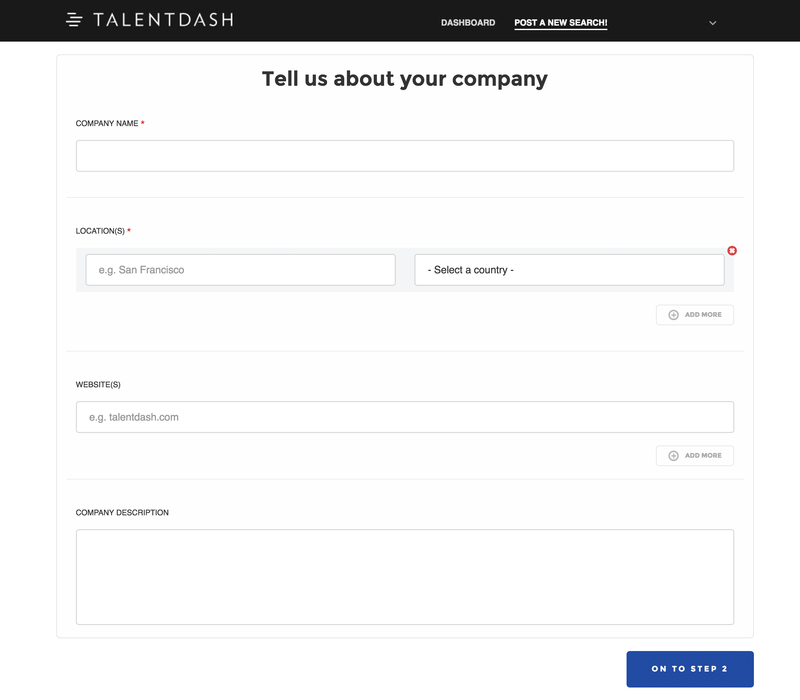 TalentDash is rather straightforward and easy to use, but we would still like to take you through it so that you can maximise your experience on our platform. So you’ve got your hands on a new account at TalentDash, congratulations! We know that you should not have any major issues while using our platform, but because we want you to maximise your experience on our platform, we have come up with an in-depth guide on how to use it. After all, our mission is to help you build a robust talent pipeline with our talent-mapping platform, and knowing the function of certain features will go a long way in your pipeline-building process. 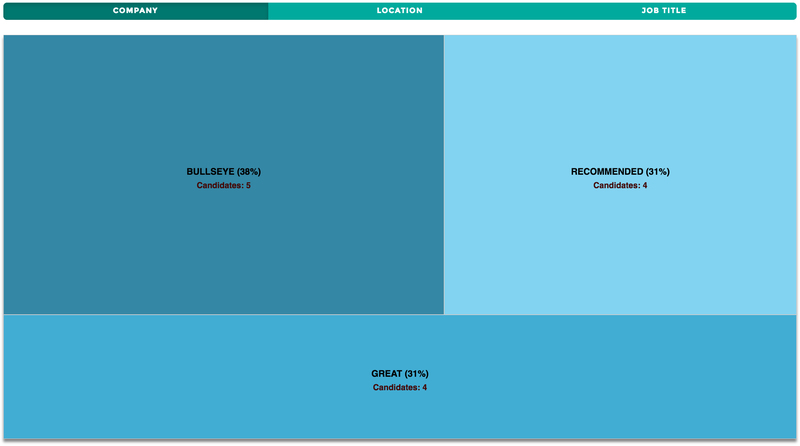 Still not convinced about the benefits of talent mapping? Read about it here. Once you are logged into your new account, you can immediately post a new search. Start off by sharing a little bit about your company. And then proceed to fill up your search requirements. The form is fairly straightforward, but if you are unsure how certain fields work, simply hover over the little question mark for instructions. We take pride in helping you source for your ideal candidates, so being specific will help a lot. Check out the little ways to refine your search criteria as much as possible, such as adding in alternative job titles. Once you’re done, click ‘Let’s Get This Finalized’ to finalise your search! Realised that you missed something out in your search? No problem! You are able to edit your search as long as it has not been started. In case you are unable to edit your search because it is already in progress, you may contact your account manager for support. 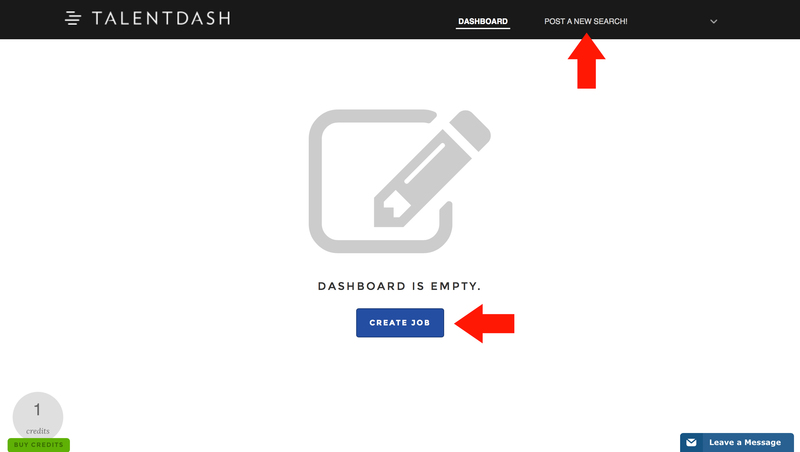 Once your search has started, you may monitor its progress (although you do not really need to because you will be notified of your search status via email) on your dashboard. The incompletely coloured ring(s) gives you a rough gauge of the progress of your search. When you return to your dashboard five days later, your three circles should be fully coloured—red, teal, and yellow. 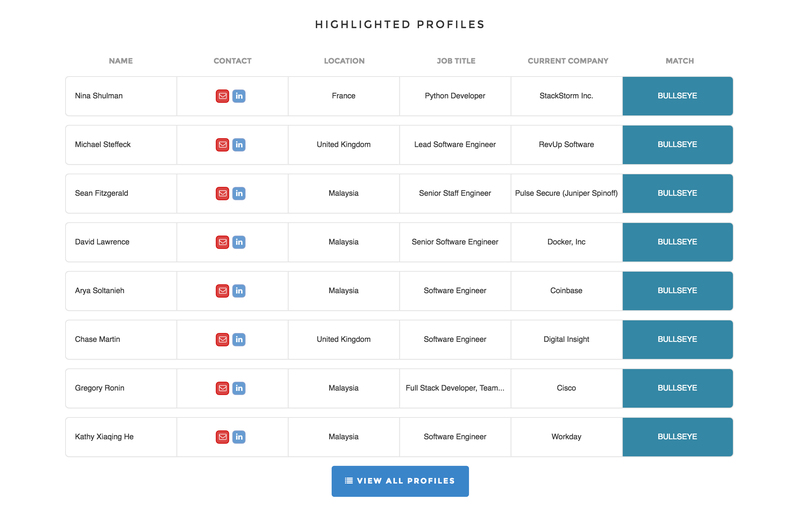 The teal circle in the middle gives you a quick indication of the number of profiles that have been collated according to your search criteria. To view the breakdown of the data, click on your completed search (on your dashboard), and scroll down. You will be greeted with a list of highlighted candidates. Get started with building your talent pipeline as soon as possible by knowing whom to contact first! Click on the red icon to retrieve their email address, or on the blue icon to be directed to their LinkedIn page. Click on the candidate’s name for a quick summary of his/her profile. To save a copy of the entire list of profiles, click on ‘View All Profiles’, and you will be directed to a new page where you will be able to download the data. The data will be given in an Excel spreadsheet file (.xlsx) which is compatible with most applicant tracking systems (ATS). 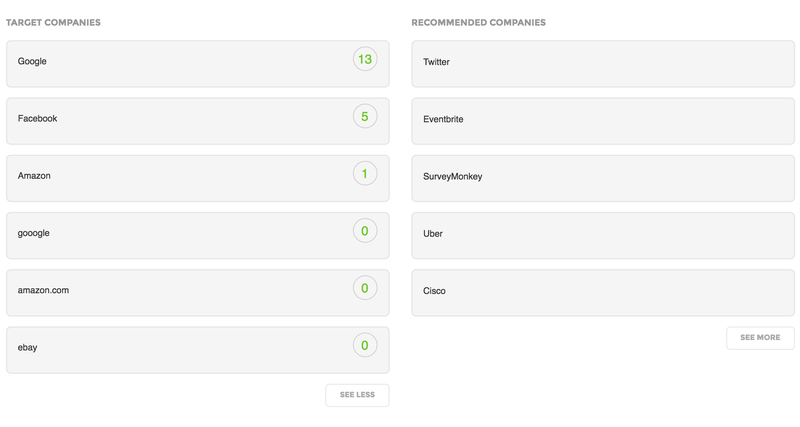 With the raw data, you can start building up your own database of contacts. When filling out your search, you are able to list the target companies that you want your candidates to have worked in or are currently working in, and also the companies that you do not want profiles from. Besides giving you the results of the search from your target companies, the platform also recommends companies that you can consider looking at for your ideal candidates. This feature lets you know whether you are looking in the right place, and it also helps you cast a wider net for your search. So your search managed to retrieve 307 matching profiles, but that is a lot to go through. 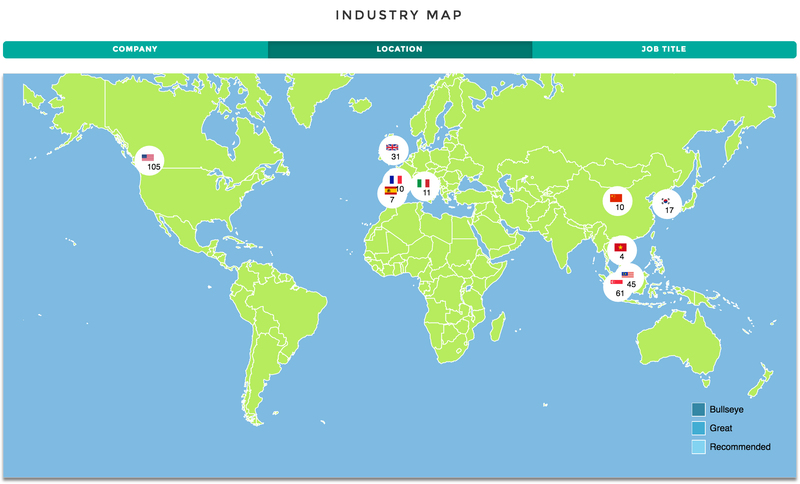 How about using our three visual maps to get an overview of the talent pool? 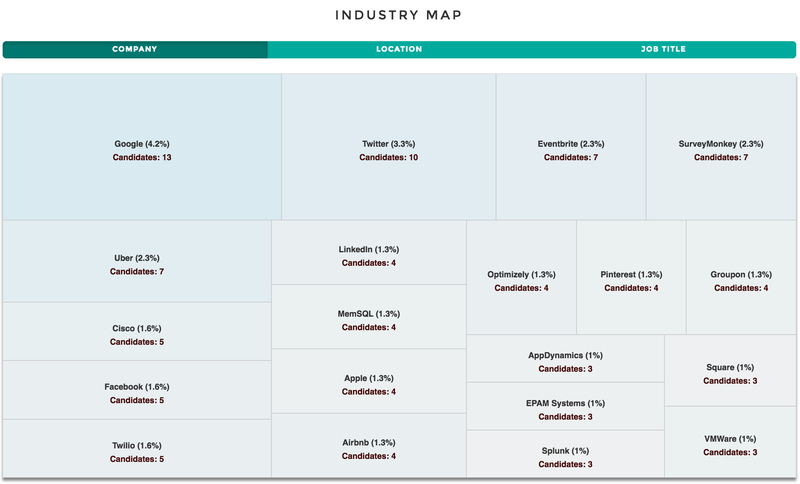 The first heat map gives a break down of the top 20 companies that your preferred candidiates are working in. Click on any of the boxes for more insight, and you will also be directed to a new page for the individual profiles. 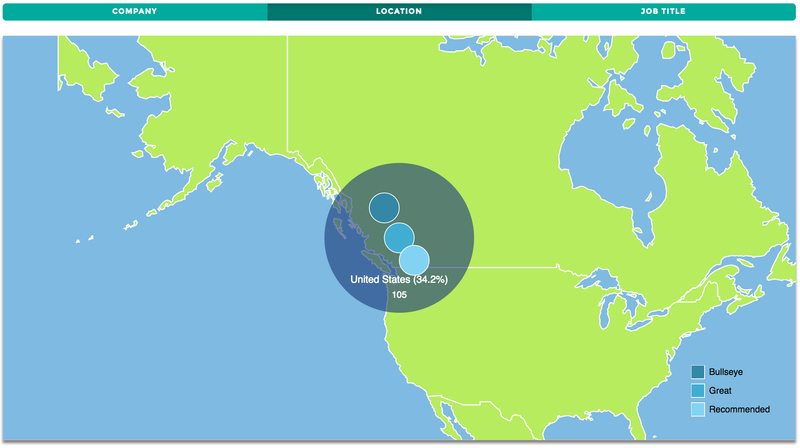 The second heat map is a location map that gives you a bird’s eye view of the distribution of talent across your defined location or region. Click on the flag(s) for more details about the candidates that you can find in that country. Once again, the different shades of blue indicate the quality of matches. For more details, click on the the blue circles. 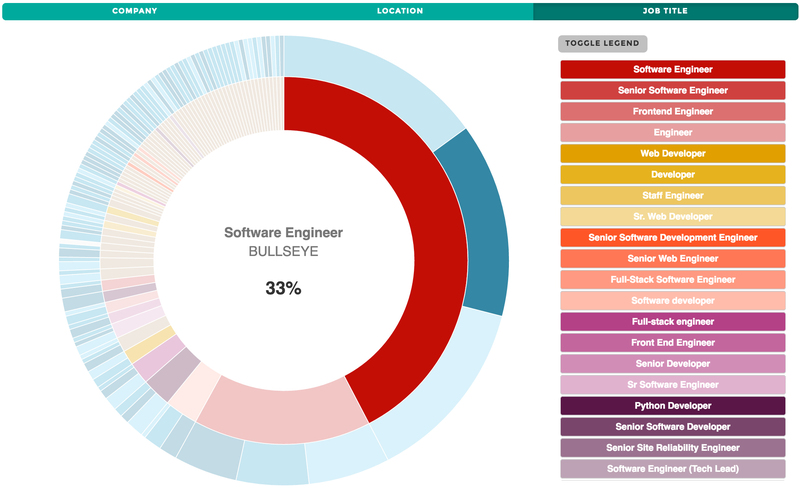 The third heat map is an advanced pie chart that tells you the alternative job titles that were found, which matches your search parameters. 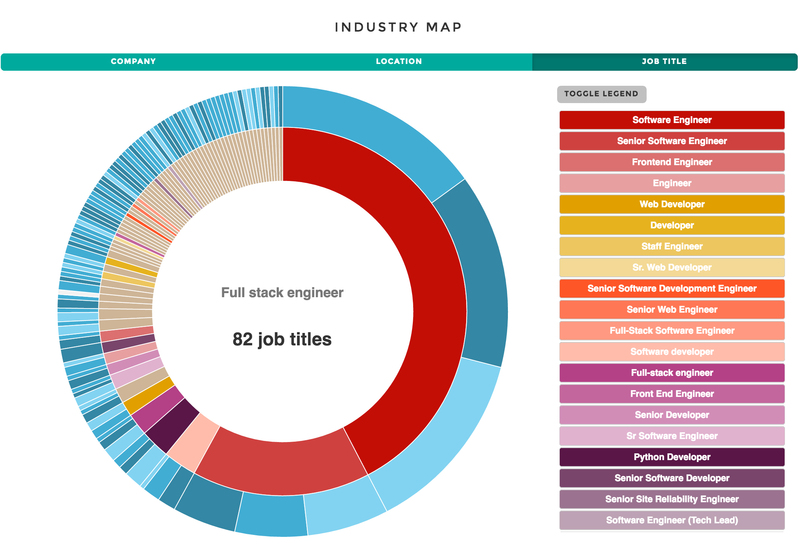 For example, your search for Full Stack Engineer has returned 307 matching profiles. 42.3% of these matches may be called Software Engineer instead. The outer ring of the pie chart further breaks down this statistic into the quality of matches, indicated by the shades of blue—bullseye, great, and recommended; click on it to view the list of profiles. The list of talent in your completed search results will be unique to you because of your (unique) search parameters. 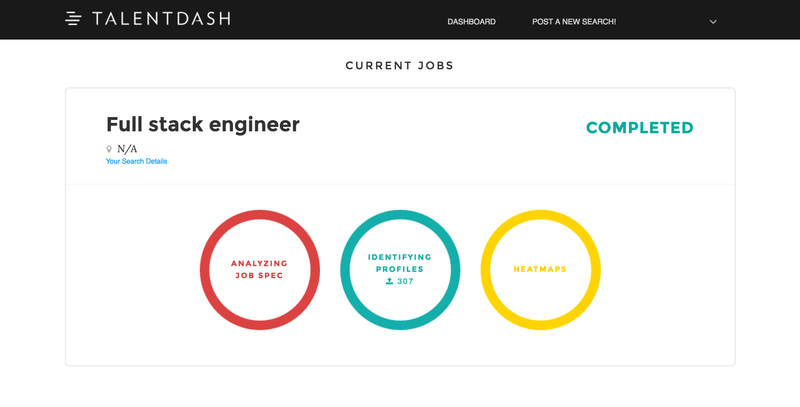 In essence, TalentDash is able to help you custom-build your talent pipeline. 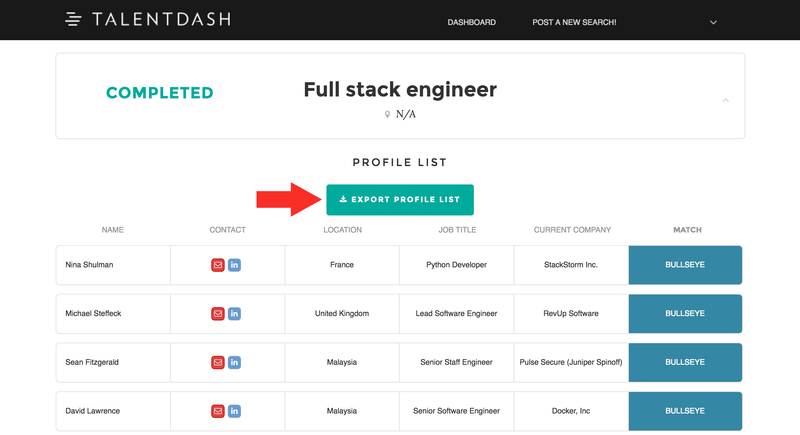 If you want to perform a deeper search, or need more support with the platform, you can conveniently reach out to us on our Zopim chat (that blue tab on the bottom right corner of your screen), or drop us an email at admin@talentdash.com. While you are working hard to build the best talent pipeline, why not have a little fun at it, exploring the talent universe with TalentDash? May the talent be with you! 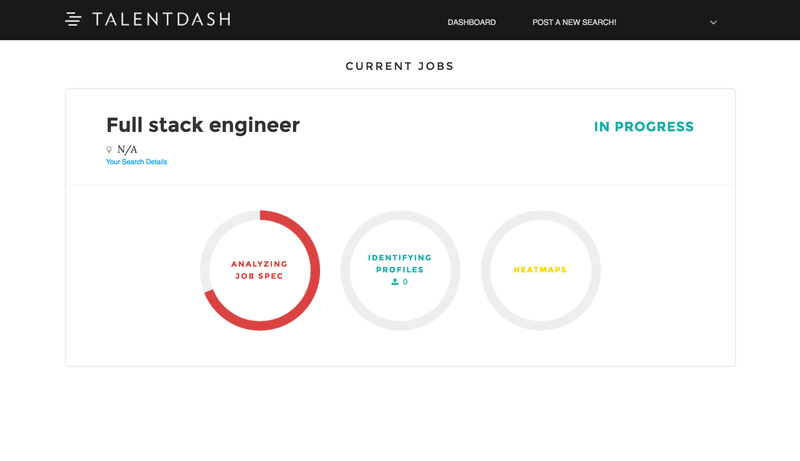 Interested in using TalentDash to build your talent pipeline? for your first 10 candidates!